Russ Rose, in his 40th season at Penn State, has won seven national titles and scores of admirers. Russ Rose isn't big on hoopla when it's all about him. 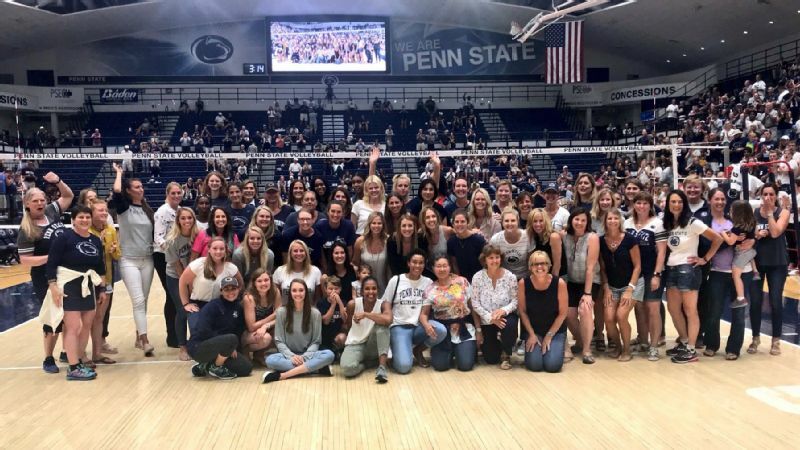 On Friday, Penn State recognized its volleyball coach for his 40 years running the program with a luncheon attended by dozens of his former players. On Saturday, the 105,232 in attendance at Beaver Stadium for Penn State football's 45-38 overtime victory over Appalachian State roared in appreciation during a first-quarter break to recognize Rose's accomplishments. After a sweep of Texas A&M at Rec Hall Saturday night, the Nittany Lions hosted an ice cream social with their fans, who took home a commemorative gnome of the legendary coach. Maybe the winningest coach in Division I volleyball history with 1,251 victories (and counting), seven national championships and 17 Big Ten titles would rather skip the commotion, but this was one of those rare times when nobody listened to him. 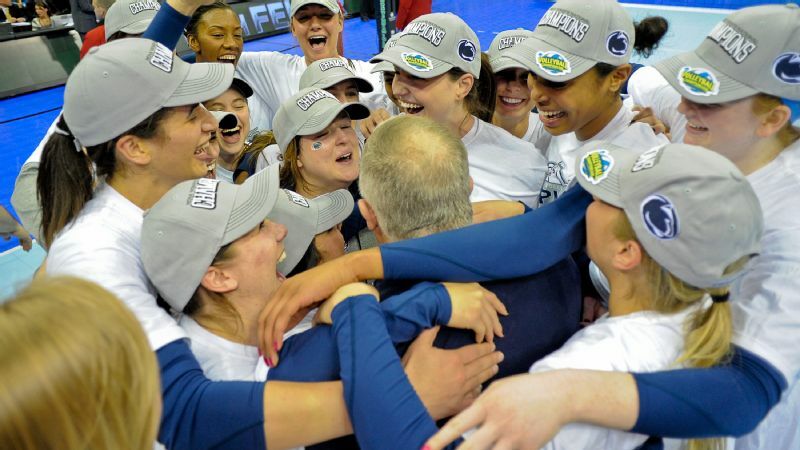 "When you think of Penn State, you think of Russ Rose," says Simone Lee, a starter on last year's final four team. "He's built an empire." The cast of that empire includes 44 All-Americans, four of whom were national players of the year. It also encompasses players like Jen Burdis, a recruited walk-on who accounts for four of the 191 times one of Rose's players has been named All-Academic Big Ten. What's remarkable is the white-haired, bespectacled 64-year-old relates as easily to today's Beyoncé fanatic who is boasting about her next Insta post as he did to the pioneers who sewed the numbers on their uniforms when he took over the program in 1979. "He's not on Instagram or Twitter. I don't even know if he knows what that is," Lions freshman Gabby Blossom says. "He has better advice than any person I've ever met. He's been around; he's dealt with everything there is to deal with, which makes him easy to talk to. He connects with us better than anybody could ever imagine." Simone Lee says Russ Rose gave her perspective. Rose often quips, "Don't go changing," and players past and present insist he hasn't, citing the handwritten letters he writes in a digital age, the cigar he whips out after significant wins and an unbridled candor Nittany Lions of multiple generations embrace. 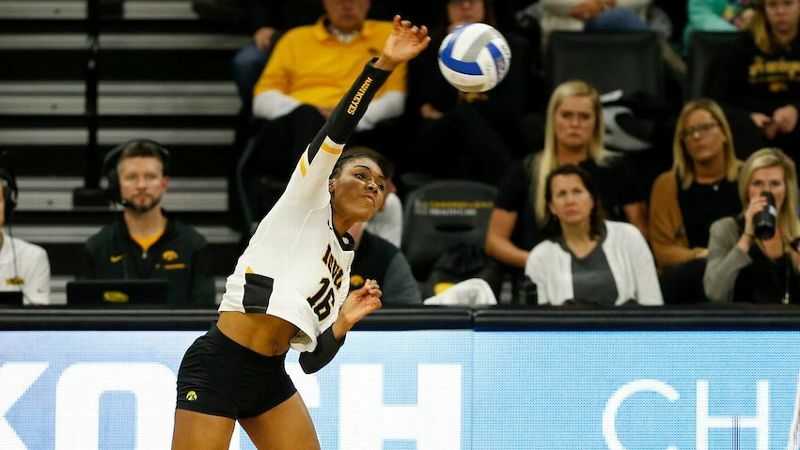 "Russ isn't like anybody else," says Haleigh Washington, a three-time All-American who graduated last spring. "I'm a decent conversationalist; he's a great conversationalist. He knows how to have a conversation in an authentic way, which is ironic because everyone sees him as this gruff, standoffish kind of guy. ... He's authentic to the people who are in his life and he's authentic to himself." 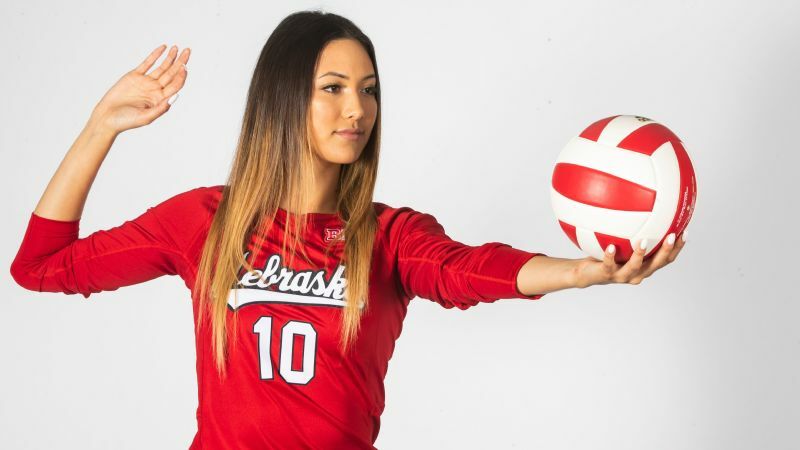 Lee acknowledges it's not unusual for young players to feel intimidated by the five-time national coach of the year, a Hall of Famer who is volleyball's version of Geno Auriemma (who has 11 NCAA women's basketball titles and 1,027 wins). Lee didn't grow up near University Park, where The Berkey Creamery created an ice cream flavor for him, "Russ 'Digs' Roseberry," a blend of strawberry ice cream, two separate raspberry sauces and dark chocolate flakes. But even coming from Wisconsin, Lee knew of the larger-than-life figure. She quickly identified with his straightforward approach, particularly his ability to decipher what motivates her without her having to explain it. They shared an easygoing dialogue when she would drop in his office -- as well as a love of R&B and hip-hop. "I had this music on and he said, 'Turn this up,' and it was, like, Mary J. Blige," she recalls with a giggle. "I love music, so we get off talking about different artists." "You end up outing yourself without really outing yourself," she says. "You realize he's been at Penn State forever and he has eyes everywhere. If you breathe or fart in class, he's going to find out. Even though he's way older than any of us, he's very good about connecting with each of us differently." Rose picked up quickly on Lee's tendency to overdramatize the smallest setback. "I bombed a test," she remembers telling him. To which he responded, "There's four more," shrugging with an expression similar to one he uses when Penn State trails 0-2 at intermission that's followed by, "We'll win in five." "Nothing's ever as bad as it seems," Lee says. "That's what I learned from Coach. The sun will come up tomorrow." 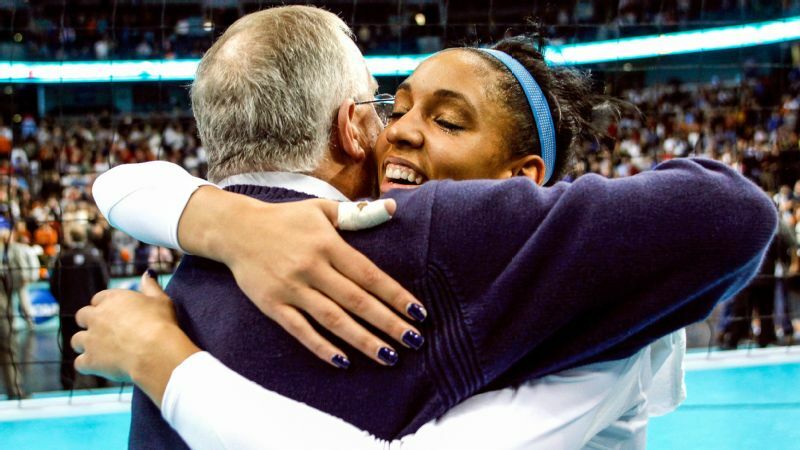 Three-time national champion Alisha Glass says Russ Rose's honesty drew her to Penn State. In an email age, Rose's first contact with a recruit is often a handwritten note. 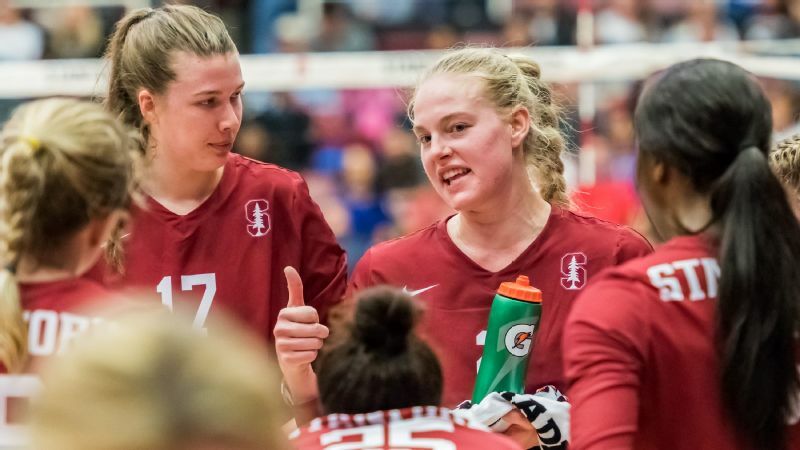 Nicole Fawcett, who won back-to-back national championships in 2007 and 2008 and was the national player of the year in 2008, remembers running her fingers over the ink. "I'd get all these letters from coaches and I would look to see if they actually signed the piece of paper," Fawcett says. "Then there's Russ who actually writes us. To this day, we still get a media guide with a personal note inside." "He still sends my mom a media guide with a note," says Salima Rockwell, a three-time All-American (1992-94) under Rose who later served as his associate head coach. "If it's somebody's birthday, he's hand-writing a note and mailing it himself. I used to say, 'At least let me address the envelopes, Coach!' He wouldn't even hear of it." Prospective Penn State players aren't fussed or fawned over by Rose. He sticks to a "here's what we got; we'd love to have you" pitch. "What got me during recruiting was his honesty," says Alisha Glass, a three-time All-American (2007-09) whose career at Penn State included three national championships. "He said, 'I'm not going to beg you and I'm not going to fill you with snuff. I think you're intelligent, and we would love to have you here if this makes sense and this is a place you want to play.'" Penn State doesn't lose many players to transfers the way some schools do. 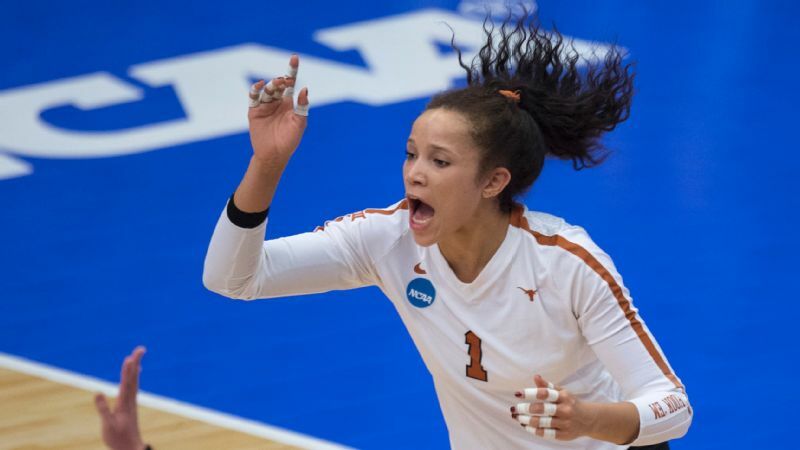 Although in 2012, starting libero Ali Longo and Darcy Dorton, who had been Big Ten freshman of the year in 2009, left. Longo landed in Hawaii and Dorton at the College of Charleston. At the time, Rose said he was sorry to lose both, "but I don't fight for anyone to stay." "He likes people who are fun and have perspective," Washington says. "He doesn't recruit people with good character. He recruits characters." 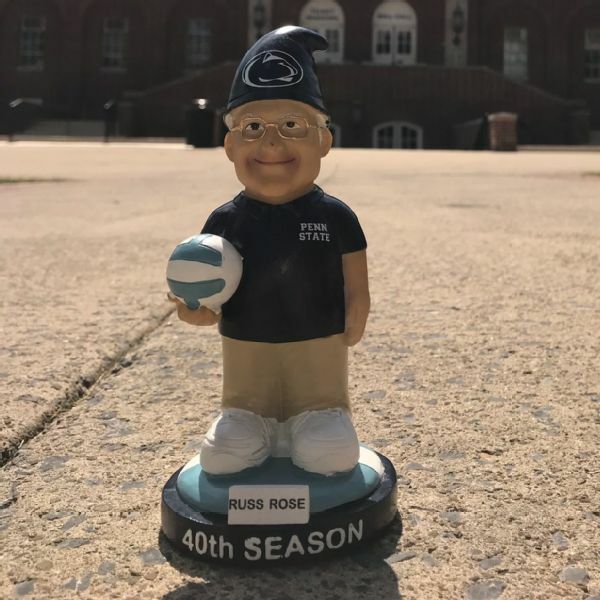 Russ Rose gnomes were part of the weekend celebration for the Penn State volleyball coach. Maybe that's because Rose is one himself, known for his dry wit and sarcastic one-liners that have kept Nittany Lions off balance for years. He once called over Fawcett during a Penn State-Ohio State match her senior year. "He said I should be given a letterman's jacket from Ohio State because I was playing so well for them," she says with a chuckle. Terri Zemaitis-Boumans, the 1995 Big Ten Player of the Year, recalled chatting with boosters after a win and Rose walking up to her and saying, "You sucked," never breaking stride. "You always know exactly where you stand with Coach," she says. "I don't want fluff; I want the truth even if the truth is in your face. Even if the truth is that I sucked." Charter flights were unthinkable when Rose assumed the coaching job in 1979 making a salary of $14,000. Back then he drove a 17-passenger van for road trips. 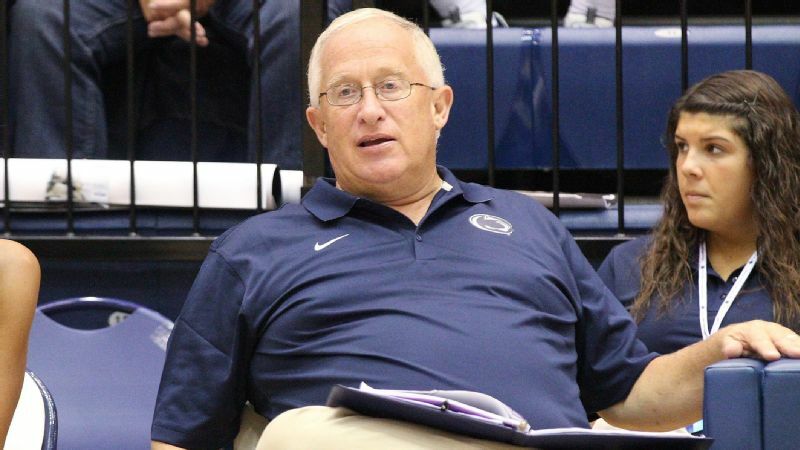 Legend has it that in his early days, he would stand outside of Rec Hall and ask any tall female student who walked by to throw a rock to judge her athleticism. Analyzing the toss, he might ask her to consider volleyball, once snagging a student en route to cheerleading tryouts that way. Then there was the time he pulled a rental van into a garage during a road trip in Utah and realized it wouldn't make the clearance. He hopped out, turning the keys over to one of his players, an engineering major, and declared, "Let's eat." He has an intense side, too. But that's typically reserved for three-a-day preseason practices in swampy South Gym. 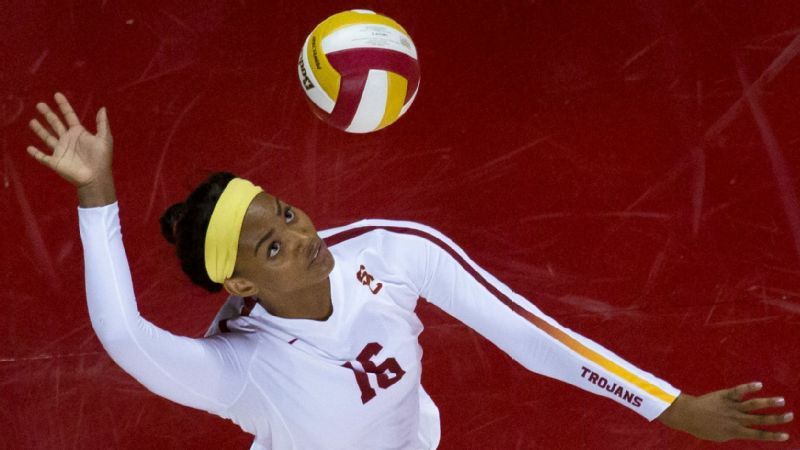 In the player-driven environment, the upperclassmen stress the expectations to carry on the tradition that includes the program's first-ever national championship in 1999, an unprecedented run of four straight from 2007 to 2010 and titles in 2013 and 2014. "When the doors are closed, when we're in South Gym and nobody is watching, that's when it matters to Coach," says Christa Harmotto Dietzen, a four-time All-American (2005-08) and former national team member. Dietzen still sounds exhausted recounting practices from 2007 -- the beginning of Penn State's four-in-a-row string of championships. "We lost all the time in practice," she says. "Monday to Thursday he would create these situations where it was really hard to win. He'd add his assistant to the scrimmage. ... He'd raise the net higher. He knew the potential of what we could handle, and he'd push the ceiling." Penn State won an NCAA-record 109 straight matches between 2007 and 2010. "He knew the potential we had, and if we were winning all the time in practice, I don't think we would have had that success," Dietzen said. "It was mentally grueling." Not that Rose doesn't toss in some lighthearted banter into the long sessions. Russ Rose led Penn State to a fourth consecutive national championship in 2010. He's tacked on two more since. Claudette Otero, who played from 1993 to ' 96, regularly contained her thick, brown hair with a sturdy tie. "Her hair tie never stayed in," Rockwell remembers. "Russ was always in a quest to make it fall out. We'd run sideline to sideline, drill after drill. He'd say, 'We're not stopping till it's gone!' "
During games, Rose favors subtlety over histrionics. He knows how to have a conversation in an authentic way, which is ironic because everyone sees him as this gruff, standoffish kind of guy. "When he stands up during a match and puts the binder over his mouth, you know you're going to hear it," Dietzen says. 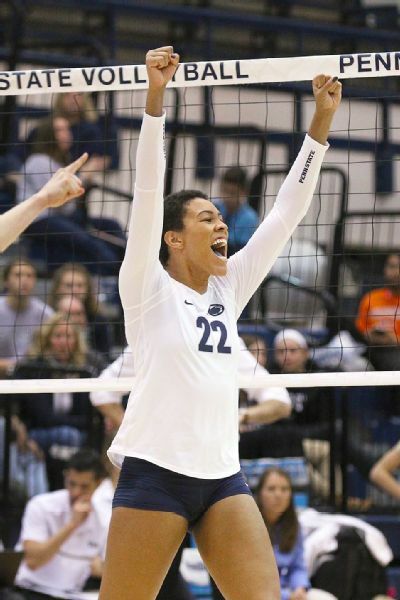 She was a freshman when Penn State swept Northwestern over Halloween weekend. Many players had family in town. Rose was disappointed by the effort despite the score. "We had a four-hour practice on Sunday," Dietzen says. "You were mad at the time; once you realized the expectations, then you understood. You settled in. Lee says once you're part of his program, "you're never actually gone. It's home," and she says Rose is the reason why. 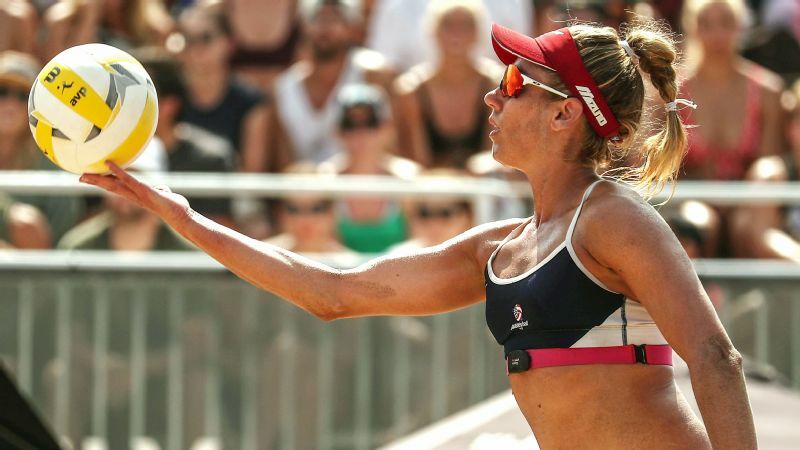 She plays for Karch Kiraly on the national team, but Rose, she says, "will always be Coach to me." Players regularly dial him up seeking coaching or life advice. "He loves that," says Lori Barberich, a three-time All-American (1982-84) under Rose, and later an assistant who is also his wife of 32 years. "If one of his players calls, he's answering the phone. I thought all coaches did that, but the older I get I talk to players who have no communication with their college coach. For him, coaching is all about relationships and building them. That's what he loves the most about all of this." Dietzen was touched when Rose attended her wedding in Pittsburgh in June 2014. Burdis, who is dyslexic and struggled with confidence when she arrived at Penn State in 1993, recently wrote her first book, "The EnduNinja Mindset: 11 Habits for Building a Stronger Mind and Body." She describes it as a thank you to Rose for pushing her to reach heights she never imagined. "He raised the ceiling for me more than anyone ever had, and I didn't want to let him down," says Burdis, who returned to University Park earlier this year for a book signing. Former Penn State players turned out on Saturday to celebrate Russ Rose's 40 years at the school. Rose hasn't spoken of retirement; he signed a five-year extension in 2015. His place at the top of the volleyball world won't be challenged anytime soon. Retired Hawaii coach Dave Shoji is second in Division I in wins with 1,202. Among active coaches, Florida's Mary Wise's 908 victories rank No. 2 to Rose. Eight freshmen on the 2018 roster will get their fill of Rose over the next four years. Blossom is ahead on the learning curve because she arrived on campus in January ahead of the others. She was the lone gopher on newspaper duty -- a tradition of freshmen delivering Rose a stack of newspapers by 9 a.m. The instructions call for slipping them under the door if he's not there, but most often he's sitting in his chair inquiring about a grade, class or the shenanigans they got into overnight. "Just about every day all summer I talked to him about something," Blossom says. "Before you get to know him all you know is he's this big legend in volleyball. But then you sit in his office and realize how much he wants to get to know you, and you realize he's super cool." Of course, Penn State is a title contender again, ranked sixth at 5-0. "Coach found his niche," Zemaitis-Boumans says. "There's certain people in life who found what they're meant to be doing, and this is what he's meant to be doing. When I think of how brilliant he is, he could probably be doing anything, but he chose to coach women's college volleyball. "Thousands of women have been blessed because of his decision to do that."